: 15 р. 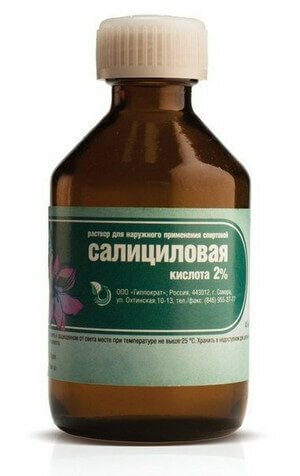 Average price online * : 15 p.
Salicylic alcohol is an affordable and effective remedy for eliminating skin problems. Often the tool is used in the fight against acne and acne. Alcohol solution of salicylic acid has excellent antiseptic, antibacterial, antifungal and anti-inflammatory properties, it costs a penny and is sold in every pharmacy. Salicylic alcohol is a mixture of ethyl alcohol and salicylic acid in various concentrations. Salicylic acid was first obtained from the bark of willow trees and used to treat rheumatism. After some time, it began to be used for the treatment of external lesions caused by the activity of microbes and bacteria. narrows the vessels at the site of application. 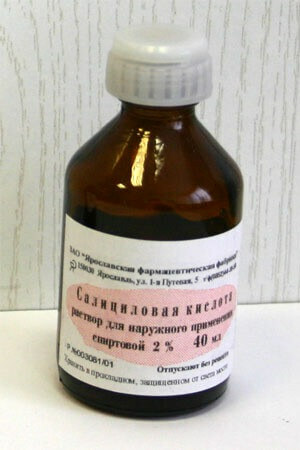 The alcohol solution is available in dark glass bottles of 24 and 40 ml. Depending on the concentration of active ingredients, 1%, 2%, 3%, 5% and 10% alcohol are distinguished. Note! To combat acne and acne, only 1% and 2% alcohol is used, as a more concentrated solution can cause deep burns and traumatize the skin. Use the solution must be very careful. 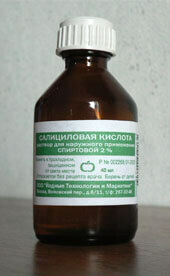 It is recommended to start the application with 1% alcohol, since reactions of intolerance are possible. 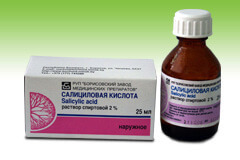 Salicylic alcohol is used only for the local treatment of the diseased area. The most commonly used point application with a cotton swab (if we are talking about small lesions, such as warts or acne). Treatment should not last more than 7 days. Apply the composition to the skin should be 3-4 times. If the drug is used to remove corns and corns, it is necessary to make a hygienic hot foot bath (if there are no contraindications for this). Important! It is forbidden to apply the composition to healthy skin, as there is a high probability of damage to uninfected tissue as a result of a burn. Salicylic alcohol should not be used on areas of skin with a wide area of ​​damage, as well as with increased dryness or hypersensitivity reactions to ethanol or salicylic acid. Alcohol solution of salicylic acid does not penetrate into breast milk and is not absorbed into the general bloodstream, therefore it cannot harm the fetus or child. According to strict indications, the drug can be used during specified periods. With local use, overdose cases are not recorded. 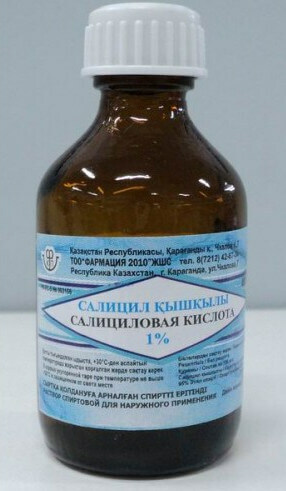 However, it is necessary to observe precautions: the bottle with the composition should be placed on a flat solid surface to prevent it from tipping to open areas of the body. If, however, an unpleasant situation occurs, and a large amount of the solution is on the skin, immediately rinse the place of contact with running water and apply a medical ointment. After first aid, contact a specialist. tightness of the skin (mimic movements cause discomfort). These phenomena are not a reason to cancel treatment in cases where they have a weak or moderate severity, and also pass after 1-2 days. If this does not occur, the use of the agent should be discontinued. Unlike most drugs, which are stored at a temperature not exceeding 25 degrees, salicylic alcohol should be stored in the range from 10 to 18 degrees. Care must be taken to ensure that children and pets do not have access to storage. Shelf life - 3 years.